My sister-in-law is a pretty amazing esthetician. When you have an esthetician in the family who gets to look at your face across the dinner table every week, you get all sorts of discounted facial treatments. Not to mention your eyebrows always look amazing. Eyebrow waxing may or may not have been a family activity. But when you move 1000 miles away, 1016 miles to be exact, you have to start taking care of your own skin. The washing and moisturizing is easy enough, I can even get my sister-in-law to send me great products to take care of that portion of my skin care ritual, but I am on my own for the rest of it. This week, as part of my participation in BlogHer and Best Buy's Inspiration to Fitness, Best Buy sent me a tool to help with the task of taking care of my skin. They sent me the PMD Home Microderm Abrasion Device. It may look intimidating at first, but it comes with a short video that walks you through how to put it together, use it, and clean it. They even show you how to test your skin to find out your skin type and make sure you are using the correct disk. It is all really easy, and in a matter of minutes you have basically buffed away all of the dead skin cells on your face. It's handy in the winter time when your skin tends to dry out, and it is going to come in very handy in the summer time when I spend a little too much time outside in the sun and my skin, even after repeatedly applying sunscreen, starts to look a little weathered. With repeated weekly use it can also help reduce the appearance of fine lines and age spots. Dr. Oz even had this handy dandy device on his show as an inexpensive alternative to Botox. And it isn't just for your face. The microdermabrasion device features caps for your body too, so you can use it on your arms, hands, and even your elbows. I need to use it on my elbows! Now that I have had a chance to use it, I want one of you to have a chance too. Would you like to win a PMD Home Microderm Abraision Device for yourself? Leave a comment letting me know why you would like to own one, and you will be entered for a chance to win. Rules: No duplicate comments. You may receive (2) total entries by selecting from the following entry methods: a) Leave a comment in response to the sweepstakes prompt on this post b) Tweet about this promotion and leave the URL to that tweet in a comment on this post c) Blog about this promotion and leave the URL to that post in a comment on this post d) For those with no Twitter or blog, read the official rules to learn about an alternate form of entry. This giveaway is open to US Residents age 18 or older. Winners will be selected via random draw, and will be notified by e-mail. You have 72 hours to get back to me, otherwise a new winner will be selected. The Official Rules are available here. This sweepstakes runs from 2/1 - 2/7. I have started noticing as I am getting older, that my body is changing as well as my age. Sigh. I would love to try this product to help keep the aging process at bay for as long as possible! I totally have an appointment for botox next week. If this really does work I would love to own it. I never thought I was looking older until my 13 year old daughter told me ever so nice that I was OLD looking. My skin has taken a beating after kids. I to have a product that would love to have a product that would improve it and keep me looking young! Winter has been rough on my skin. One of these would be wonderful! Living in Colorado with the strong sun and dry air is hard on the skin--so this would be wonderful to have! I would love to win this ad try to make my skin look younger! This sounds better than just continually applying "stuff" to the skin. Every once in a while it's good a good scrub. This has to be much cheaper than the spa, too. This is EXACTLY what I need for my face. When your face feels great your whole outlook of yourself feels better. I would LOVE to win this product! Now that I'm in my thirties, I need to start taking care of my skin more than just washing and lotioning. I would love to own one because I need all the help with my skin tone that I can get! This sounds awesome! I've got three little ones and I need all the help I can get to not look like a run-down mess! I would love to own this kit because I'm in my 40's now, and I really want to stay on top of all those fine lines before they get too noticeable! I'm not afraid of getting old, but hey, every little bit helps!! Reason is I'm 23 and I have the skin of a 40 year old. I've been told about this product but I haven't been able to spare money for it...Thank you for this opportunity. I'm very grateful. I will be 40 this year and want to take better care of my skin! This would definitely help! Thank you! I would love to own this PMD...as I'm getting older, my skin condition is not as great as before. I heard many great thing about microderma Abrasion and would love to give this a try. Whoa. Whoa whoa whoa! This looks incredible. I've been going once a month for the past 3 months paying WAY too much to try to get rid of the spots on my face - the aging spots - from when I was in the sun in my 20's. I'd love to have this! Sounds amazing! My skin has been going crazy with pregnancy hormones and I would love to give this a shot! I would love to give this a try! I have my 30th High School Reunion coming up this summer and it would be great to look my best! Copying url wasn't coming through. I need this bc I am a mom that needs a little extra care for my face. I'm such a slacker when it comes to skin care. I need to get better about it before it's too late and I look older than I am. I would love to use this on a regular basis to prevent my skin from aging more than it has already. Since I have reached the age of 50 I have noticed a rapid decline in my skin. Would love to have one of these! I'd love to own one because at age (almost) 52 I could use the help! 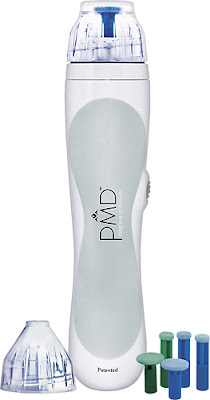 I really want to own this PMD and give it a try as I am getting older, my skin is also getting older, I want to look much younger than my actual age. I have wanted one of these for THE. LONGEST. TIME! I need to own one because my skin is definitely playing tricks on me with with a huge cross country move, a birthday in two days, two kids and a new pregnancy! PLEASE!! PLEASE!!! PLEASE!!!! I would love one because my skin gets SO dry and flaky. I hate it! I am turning 32 and up until I was 30, I had never used lotion or special cleansers of any kind. Now that I am finally taking care of my skin, believe me- there is a lot of catchy up I need to do! I would love to win this! I have been saving money so that I could have it done in a spa, but that is taking forever!! I would love to win one of these! My skin would love it too! What an awesome promo. I would love to try to reduce my new antiquing that just started this year. I would love one to hopefully help my skin- and make me look younger! I seem to be breaking out like a teenager, and this would help clear up some stuff! I'd love to try this out. My skin has always been dull unsteady. I'd like the care I take actually show for a change!